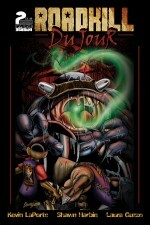 In Roadkill du Jour, writer Kevin LaPorte (Inverse Press’ Clown Town), artist Shawn Harbin (BSX22 Studios’ The Dungeon Comic), and colorist Laura Guzzo (Action Labs’ PrinceLess) portray the awful plight of a devastated biker afflicted with the curse to eat only that which dies on the road…and to then assume the traits of the very creature which he consumed. 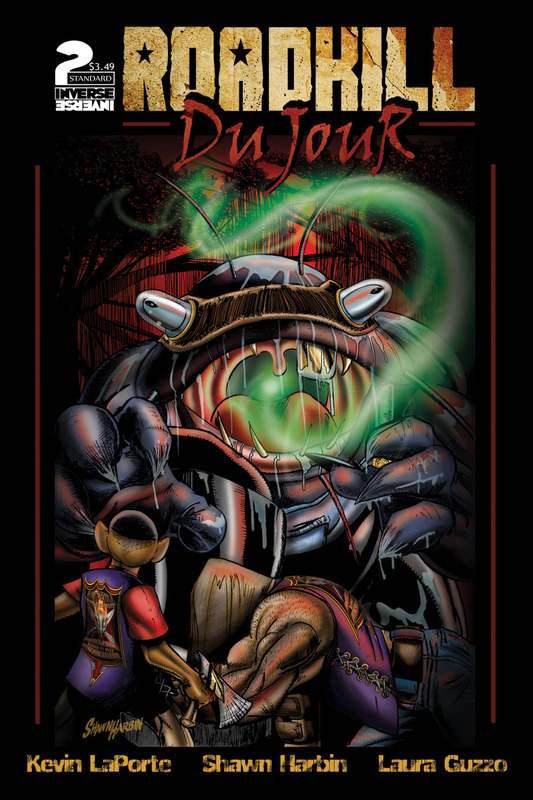 This biker, duJour, longs to recover the soul of his lost wife and gain vengeance against the voodoo witch who hexed him and murdered his gang. In this second chapter, he recruits avenging weapons in the forms of NEW misfit members of his Roadkill Motorcycle Club, all the while watched and warded by the witch, Mama Houdoo, and her legion of horrific minions! Gun-toting, conjoined triplets! Wedding vows of death! Anthropomorphic biker catfish! Grenade-addicted pelicans! Soul-shredding owls of doom! ALL in Roadkill du Jour #2! For readers new to the story, Roadkill du Jour #1 remains in print and may be added to rewards for the issue 2 Kickstarter campaign or purchased directly at http://inversepress.com! Kevin, Shawn and Laura are available for interviews by phone, Skype, chat or email, and promotional and sample art for Roadkill du Jour #2 is available upon request.